Class of 2016 big man Jon Teske took an unofficial visit to Ann Arbor on Sunday evening and the Wolverines continue to trend positively in his recruitment. Teske’s most recent trips to Ann Arbor were in June for Michigan’s College Practice and Team Camps. Teske received new interest from a handful of Big Ten schools during July, but Michigan and Ohio State are two his top two offers. Wolverine head coach John Beilein was seen tracking Teske during all three evaluation periods and has prioritized the young big man. Michigan is also expected to host Williams transfer Duncan Robinson for a multi-day visit beginning today. Find a rundown of past, present and future recruiting visits on our recruiting visits page. While Michigan has prioritized a number of targets, including Teske and Robinson, its recruiting board also expanded during the July evaluation period. Several new prospects have emerged on the radar and some have already setup visits. Michigan will host class of 2016 power forward Tyler Cook for an unofficial visit on August 9th, according to Ben Weixlmann. Cook is a 6-foot-8, 240 pound power forward with offers from Virginia Tech, Memphis, Iowa State, Tennessee, Miami(FL) and Purdue. He’s ranked 97th nationally according to 247Sports Composite and plays on the same AAU team as Michigan guard target Quentin Goodin. Cook averaged 5 points and three rebounds per game while playing up a grade at the 17U level with the St. Louis Eagles EYBL squad. Friday’s big news was that South Carolina guard PJ Dozier was going to take one of his five official visits to Michigan. Over the weekend, Dozier finalized his visit dates. The 6-foot-5 guard will trip to Michigan the weekend of September 26th for the Wolverines’ football game against Minnesota. Dozier will also visit Louisville (August 31st), North Carolina (September 6th), Georgetown (September 13th) and South Carolina (October 17th). Michigan has already offered a number of top point guards including Derryck Thornton, Cassius Winston and Quentin Goodin and the Wolverines are also recruiting Team USA U17 point guard Devearl Ramsey. 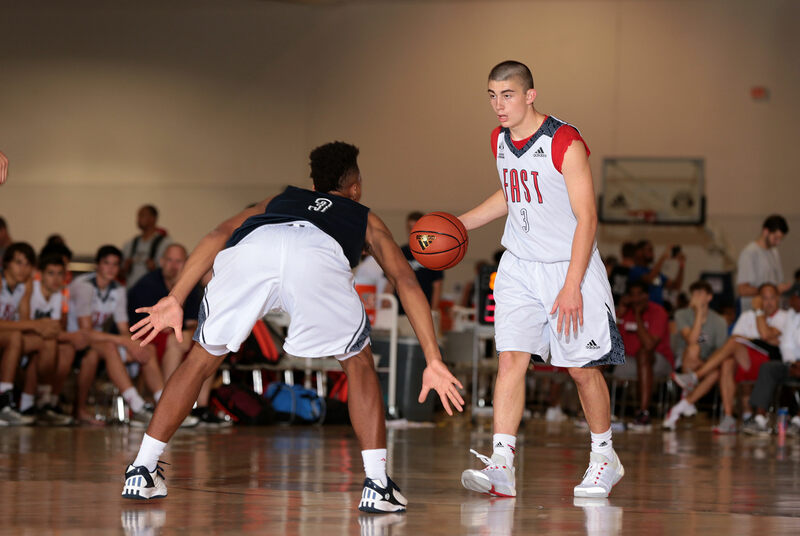 But John Beilein and his staff continue to add 2016 prospects to the radar including Payton Pritchard. Pritchard is a four-star prospect and the No. 36 overall player in the country according to the 247Sports Composite Rankings. Pritchard has offers from UCLA, Villanova, Virginia and Wisconsin. Michigan State and Kansas are also trying to get involved in his recruitment, according to 247 Sports. Class of 2015 prospects Dillon Brooks and Jalen Poyser continued their monster summers at Adidas Nations over the weekend. Brooks averaged 21 points per game while Poyser, a 2015 point guard, averaged 18 points per game for Team Canada. Brooks has been hearing from Michigan, Syracuse and Michigan State and has offers from Iowa State, Kansas State, Providence, Dayton, Maryland and Indiana. Though he is on the lean side, Poyser has good size overall and a nice feel for the game. He is adept at penetrating defenses via the dribble, can score in the lane and makes very good decisions. He is certainly glad for the opportunity to show more people what he can do. According to Poyser, he will get more serious about his recruiting and deciding on visits after he finishes up with Nations and the Nike Global Challenge in a few weeks. He has heard from Oklahoma,Michigan, Michigan State, Wake Forest, California, George Mason and Idaho among others and doesn’t have any favorites. The Adidas Nations Championship and 3rd Place Game will air on ESPNU this evening at 7 p.m. (3rd place) and 9 p.m. (championship). The Championship will feature Team Wall, with TJ Leaf, Kyle Guy and Payton Pritchard, against Team Lilliard, with Dennis Smith Jr. and Eron Gordon. 2015 guard Jalen Coleman will take an official visit to Notre Dame on September 6th. Kenny Williams has been offered by Georgetown and North Carolina. Team USA point guard Devearl Ramsey scouted in-depth. Summer highlights of 2016 offeree Seth Towns. Matt Moyer added another major offer, this one from Ohio State. Fresh highlights of Derryck Thornton from earlier in July. The talented guard is sidelined with a broken hand but has added interest from Duke. Shake Milton had been linked to Michigan interest, but the 2015 forward trimmed his list to Indiana, SMU, Illinois and Oklahoma.